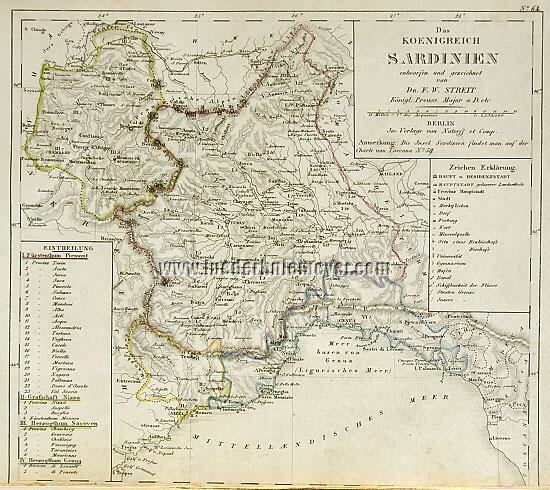 Sardinia, The Kingdom of. With title and 2 explanation cartouches. Map designed and drawn by Friedrich Wilhelm Streit (Ronneburg, Thuringia, 1772 – Berlin 1839). Steel engraving colored in outline for Natorff & Comp. in Berlin. (1836.) 9⅛ × 10¼ in (23.3 × 26.1 cm). Comprising the principality Piedmont including Lake Geneva, the duchies Savoy and Genoa as well as the county Nice, but without the island Sardinia, further still with Milan and Crema. – The Mediterranean coast in the west up to St. Tropez + Antibes, east up to Livorno. – With designations for i. a. arch episcopal and episcopal sees, universities and secondary schools, mineral springs as well as harbors and navigabilities. – Below trimmed to borderline.